After being immensely disappointed that most of the Wegmans premium pints looked melted, I decided that going low fat made sense to balance things out with my other purchases. Would I regret that decision? 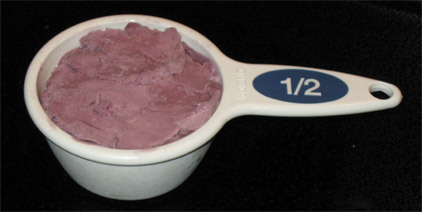 Here is Wegmans Black Raspberry Low Fat Ice Cream. I was astonished that this budget ice cream actually had a plastic seal. I haven't seen one of those on a big container since.... iunno, the late 90s? Well, at least it feels that long. It's good to see it back. I look forward to a lack of ice crystals. And here we are inside. Looks fairly normal (notice the choppy scooping pattern like most low fat ice creams). In one context it does seem like a full fledged ice cream (albeit a lightweight on the spoon). Unfortunately something is bugging me. 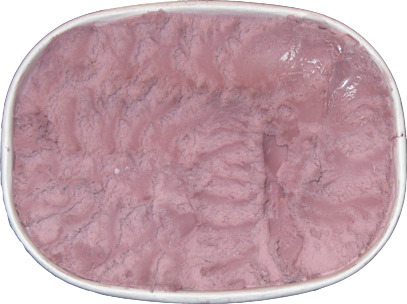 I adore raspberry ice cream but this one ain't right and it's bugging me. I don't know if it's the overall ice cream recipe or just the half real / half fake raspberry flavor, but it doesn't settle well at all. I am unamused. I trudge on because this stuff is insanely low fat, but when something is amiss, it's hard to go back for more. On Second Scoop: I just can't seem to put my finger on what's bugging me... wait, wait, I know, it's an underlying skim milk taste. Oh I hate skim milk, even 1% is rough (if you must know, I spend all my time with organic 2% milk, so tasty!). I am tempted to give Wegmans some kudos for making this fairly creamy, but at the same time I have to mock them for listing WATER as one of the ingredients. I guess I would rather have a cleaner fruit shebert than this funky low fat ice cream. Here's my third scoop and it demonstrates taking the whole proportion control thing a little too seriously. 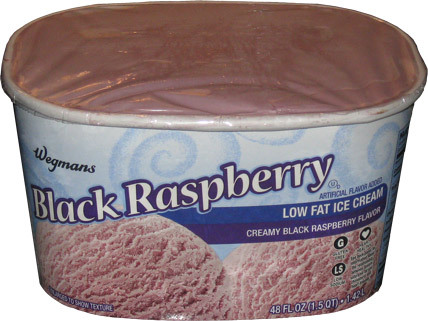 A long time ago I realized black raspberry is one of the lowest fat flavors, so during my dieting days, I would scoop a half cup exactly and eat it really slow. This may seem like a dumb trick, but it totally works. It took me longer to eat this then had I chosen a big bowl of ice cream. On Second Scoop: Ok, I've had this several times now and it has grown on me. There's just so little fat in this that you can't help but pick it as the "healthy" choice. If it was some bland generic flavor like a junky chocolate or vanilla fudge swirl, I would have lost hope, but I do adore raspberry so I kept plugging away and I think I like this stuff now. I'm also grateful there are no chunks in here, just plain and simple. It's not awesome, but like I said, it's healthy, and there's no guilt here at all. I really admire your control that you can scoop out one portion and eat it slowly! Shame it wasnt to your tastes, I love skimmed milk, its all i drink, so maybe i would like this,..who knows! I am from upsate New York where Wegmans are plentiful; lived in Boston for a time; and now live in Baltimore where we got our first Wegmans a few years ago. Their store brand ice cream is phenomenal; their Creme Brulee for example out-brulees Ben & Jerry's and Haagan Dazs. But where is there a Wegmans in New England? There is a Wegman's coming to my area in the next few months and I'm really looking forward to it. New ice creaams here I come! I moved from Baltimore four years ago and miss the Wegman's in Hunt Valley.